The Tag Rugby Trust (TRT) is a UK-based charity that connects with young people and their communities worldwide. Quite simply, we use the power and simplicity of team sport to engage with and educate individuals. Our accessible, community-led programme helps to develop the skills of individuals, as well as providing vital social and humanitarian support. The positive impact of our programme leads to lasting change within whole communities, both in the UK and in developing countries. To promote personal and community development through high quality training. To build relationships, providing opportunities for volunteers and their communities. To focus on equality, strengthening social networks and community identity. Our VISION is the end result, the finished article – what, in a perfect world, we want to achieve and see on the ground where ever we work. A world where inspired, motivated and confident individuals have the skills and support needed to deliver positive and lasting social change in their communities. The MISSION on the other hand, is what we do to realise this vision. Essentially this is the bit where, through our day-to-day work, we inspire, motivate, up-skill and support individuals. These confident individuals can then go on to help create positive and lasting social change – wherever they happen to live. To initiate positive and lasting change for individuals and communities, using the universal power and simplicity of team sport. Ultimately we want to develop active, engaged, motivated citizens. Citizens who are good for their communities, people that get things done, people who get jobs – not just any job, but good jobs, the jobs that they really want to do. According to the Confederation of British Industry’s report Inspiring Growth, in the UK more than 940,000 16-24 year-olds are not in employment, education or training. Equipping young people with the right skills and the right attitude is an essential first step to combatting this problem. Even if you’ve had a good education, getting a job is far from easy. If you’re not in the UK, things are even harder… in Uganda for example, 50% of the population are aged under 15, with limited access to secondary education. This leaves a huge population who are young, unskilled, and well below their economic growth potential. And yet, given the right training and opportunities, most of these young people are highly capable. REED, the recruitment company, highlight the skills that employers are looking for in applicants who’ve left school, college or university as the vital transferable “soft skills”. In the next five to ten years, these are going to become even more important as technology, demographic change and socio-economic disruption transforms industries worldwide. The game of Tag Rugby is just the beginning of the conversation… it’s great FUN, a “people magnet”, and it enables us to engage with individuals. Through developing skills in the game, their confidence, self-esteem and sense of ambition grow – these people go on to do amazing things! When learners have interest, education happens. Through our wide-ranging certified training syllabus – with modules from sports specific activities like coaching and refereeing, to more business related subjects like accounting and marketing – we provide a strong foundation in very practical commercial skills. Importantly however, our programme also develops the increasingly essential “soft” skills that young people really need to be successful. By providing a range of relevant and challenging opportunities we sometimes take young people and adults outside of their “comfort zone”. Through this, they change — we see improvements in physical well-being and fitness as well as in social, emotional and practical abilities. People are healthier and happier all round. The Tag Rugby Trust connects with 1,000’s of young people and their communities worldwide. Through our programmes to improve life-skills, we are also able to identify and undertake humanitarian projects within communities. These projects come FROM each community, FOR each community, addressing specific local needs. This means that each project will have maximum impact, benefitting communities as a whole. Playing sport establishes powerful human connections — bonds are created that see no limitations of gender, social status or athletic ability, and the impact upon the stability and cohesion of communities can be shared amongst everyone. 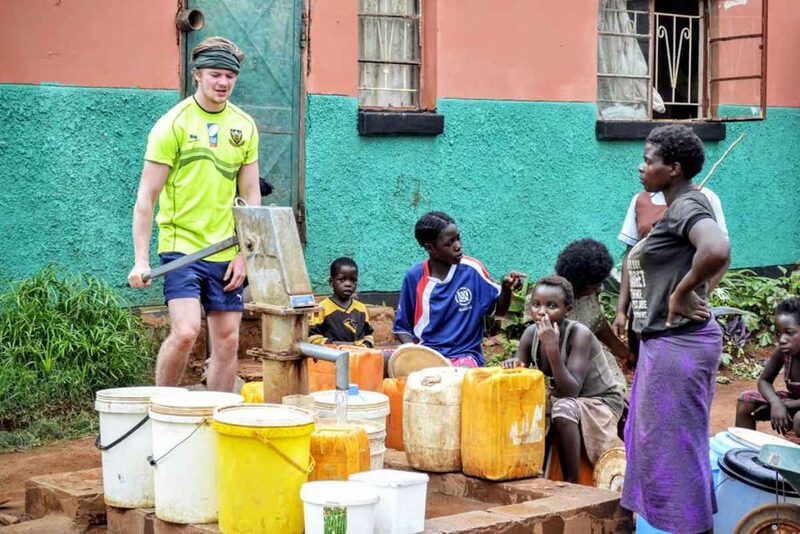 The Tag Rugby Trust helped install a clean water pump in Linda Compound, Zambia.